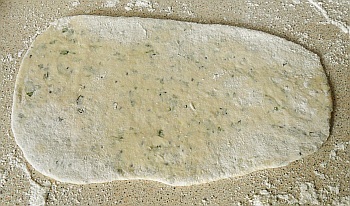 Leaven, filled, grilled, white flatbread. 200g strong white plain (bread making) flour. 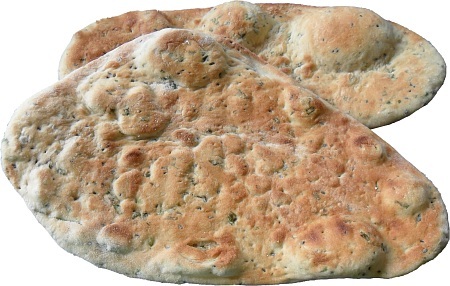 This bread doesn't take long to make and it is best eaten reasonably fresh - two days at the most - so we'll only make a small quantity here. Next, make a total of around 300mls of the yeast suspension according to the recipe. 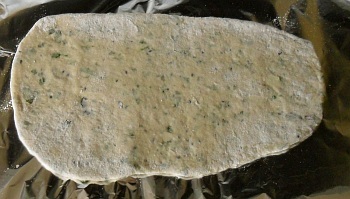 Put the flour, onion seeds and chopped coriander in a bowl and mix together. Put the dry mix in the microwave oven and give it a short blast of around 15 seconds, just enough to warm it up to around the same temperature as the yeast - this means that when you add the yeast mixture, it won't bring it to a halt by cooling it down - instead it will carry on reacting. Add the yeast mixture to the flour mixture, a bit at a time until you have a dough of a reasonable consistency for making bread. you have divided it up. 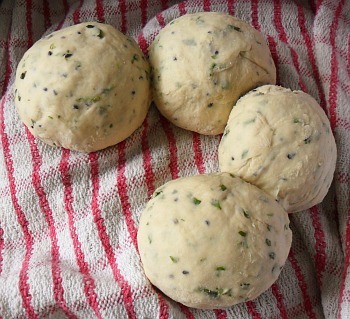 Divide up the dough equally - there is enough here to make four, reasonable-sized naans - roll them into balls and put in the the bowl and cover with a clean, dry tea towel and leave it for 10 minutes to rise and let the dough relax. about the shape - it is supposed to be tear-drop shaped. 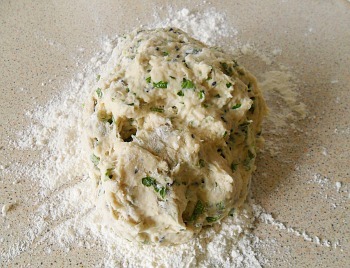 Flour your work surface and roll out one of the doughballs. The shape doesn't matter here - they are usually tear-drop shaped. The only important thing is that it us uniformly thick. In fact, you might want to consider making it the same shape and size as your lunch box. 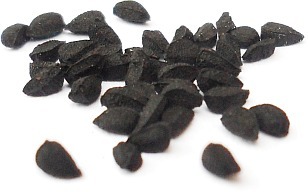 are easily cooked on a grill. You can, if you want, fire up the oven and cook your naan in that but they are only thin and, in my humble opinion, cook better under the grill. Fire up the grill and line the grill tray with some aluminium foil - shiny side up why not. and it makes a meal perfect. 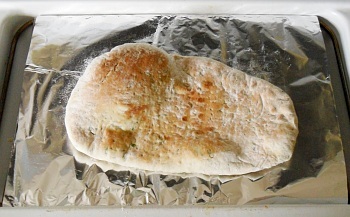 Place one of your naan on it and grill it until it turns golden brown, just like in the picture. They only take a few minutes and it is not worth leaving them unattended as you will end up burning at least one of them if you do so. They are too nice to not cook properly. Eat them whilst they are still hot or let them cool down on the cooling rack before putting them in your lunch box. They are soft but firm enough to tear up and use as a spoon for eating curry or dahl. them as a spoon for curry or dahl.